100% COTTON MATTRESSES 1 • Futon Mattresses • Kenko Mattress Topper & Pillows - Custom-made in Costa Rica. WHY CHOOSE A COTTON MATTRESS? DO YOU LIVE IN A HOT/HUMID CLIMATE OR ARE YOU GOING THROUGH MENOPAUSE AND GETTING HOT FLASHES? I have a resource to connect you with for 100% COTTON, Hand-Stuffed, Semi-Orthopedic (which means FIRM) MATTRESSES!! Since they're hand-stuffed, that means the fabric and the size can be CUSTOMIZED for whatever YOU need!!! 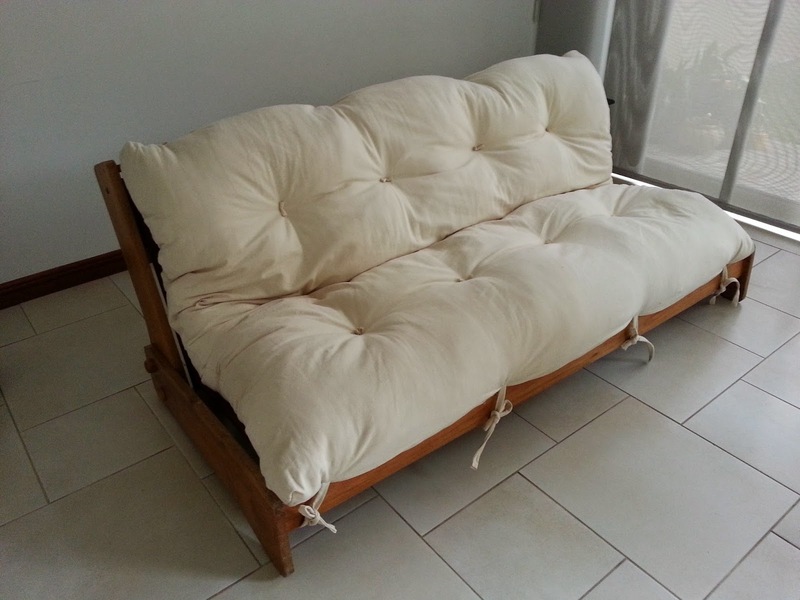 (make sure to get the INSIDE measurements of your futon frame for it to fit properly)!!! Frames are Hand-Made and made of Chilean Pine with wrought-iron details and a hand-carved headboard and base. MATTRESSES: 100% COTTON, Hand-Stuffed (hence can be CUSTOMIZED to fit whatever you need) and Semi-Orthopedic (which means FIRM). They're also available in Over-stuffed!!! They usually have some in standard ones in stock - ready for you to take with you! MATTRESS COVER: You can choose from a few styles and colors which take just a few days to get. Or choose from one they have in stock. The mattress at the top of this page is the same mattress - just the opposite side as you can choose to have 2 different fabrics!! This way you can change the decor depending on your mood!! The Kenko Naturest™ Mattress Topper combines advanced scientific technology with natural materials that are environmentally renewable and help you to enjoy refreshing, healthy sleep. RAM™ (radial-axis magnetism) Technology features spherical neodymium magnets which produce a series of overlapping magnetic fields to enfold and surround you. The physical foundation of the Kenko Naturest™ Mattress Topper is natural latex rubber — which provides an ideal blend of support and comfort, and is resistant to microbial growth and dust mites. It retains firmness better than polyurethane foam, and wicks away moisture. A natural-fiber cover promotes ventilation, helps to regulate temperature — and offers resistance to flammability without adding the chemicals that some other sleep products require. The surface of specially molded, gradient-density nodules is the final touch, producing a massage effect that helps you sleep soundly and wake refreshed. After you try the Kenko Naturest™ Mattress Topper, you'll never want to sleep without it. that grows in uncontaminated mountain regions, its transformation has no negative environmental impact and its fibre contains no chemical agents. They can ship most things to you throughout Costa Rica (possibly via bus for cheaper delivery price, weekly trucks or private delivery). Inquire about Delivery Fees. For health/sanitary reasons, ALL bedding items are NOT RETURNABLE so best for you to come up and try one out first (hence why it's important to come feel it out!!). All items non-refundable. Email me (Vicki [aka the Sarong Goddess]) your contact information (name and phone number of who's purchasing it/will be the contact person), what you're seeking and I will Connect you to my friend! Please consider making a DONATION to help keep this site alive (top right corner)! Do you, or do you know anyone that has a Costa Rica BLOG? Sharing/Trading Links can help your visibility/rankings increase. I KNOW this is why my blog comes up usually in the 1st or 2nd page often when people are google'ing things Costa Rica related! 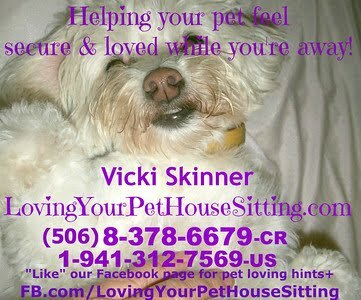 Post my link first and then E- me at - LivingLifeInCostaRica@gmail.com - and I'll get you up!!!! JUST hung up with the gal I'm Pet/House Sitting for whose's heading back via car from Bocas del Toro, Panama via the coastal route (though Puerto Viejo, Chauita & Limon) and they just decided to stay somewhere nearby because the area's been having LOTS of rain over the past 4 days and now the river is overflowing at the Bananito Bridge about 17km South/before Limon so that road is closed & water is STILL rising. UPDATE: 4pm - Looks like my friends made it across in their high truck but the flooding, if you were walking, is up to your knees so low cars may not do well with it. *STUCK ALONG THE WAY IN BETWEEN SAN JOSE AND PUERTO VIEJO OR LIMON AND WANT TO KNOW A HOTEL WHERE TO STAY?My friends got stuck with road/bridge closures and ended up staying at a little hotel about 15km West of Limon in a small town called Buffalo. They were VERY PLEASED with it and got a 2-bedroom apartment with livingroom, tv, kitchen for $60/night + 13% tax. As of 3:48pm on Saturday - the Transito website shows Highway 32 was OK/passible. CLOSED - From CATIE (on the approach to Turrialba) 2 mile to hacia la Suiza, height of the narrow, landslide, closed, no way you're passing. I just finished (for now) IMing with Ginnee in Turrialba - CostaRicaMountain.blogspot.com - who reported they've had 18" of rain in the past DAY. They have LOTS of flooding, rivers are over flowing. A landslide near CATIE dropped a tree on a bus and some of Erika's friends were on it (but they're ok). Needless to say, the road from the Caribbean that takes you through Turrialba is a no go also!!! Ginnee's going to go drive around her farm with the quad to assess any damage and take pictures. "As of this morning more than 18" of rain had fallen since last night. The photo is my driveway road through my farm. And this is as far as I could go, the streams are swollen and deep having cut since the rains started. I can not get off the farm, nor through the farm because the streams are too deep and fast for our quad. We have over-flow channels from the river, they are usually dry....they now look like a raging river. This is not our worst ever rain event, not even close (when we have big rain, the stream is fast, can wash your car away).... but it is still a lot of water. It is only a foot deep once you cross the stream, but crossing the stream is the problem. It comes from a 40' waterfall above the road about a 20 minute hike. This report is from Finca Quijote de La Esperanza above Atirro de Turrialba"
Ginnee said BOULDERS are going down the rivers they swim in!! ¿Quieres ver los Juegos Olímpicos en Costa Rica? Está en Inglés en EE.UU. en el canal NBC. Mayoría de los enlaces de Internet no me permite acceder a muchos canales de Estados Unidos DE COSTA RICADado que funciona en muchos otros países, lo que creo que es tal vez tenga algo que ver con Costa Rica no tener leyes de copyright reales / apretado??? PERO - USTVNow sí funciona! Precio de suscripción mensual de $ 19/mes de promoción para los primeros 3 meses y $ 29 a partir de entoncesTodo plan de canales CON DVR (grabador de vídeo digital)Precio de suscripción mensual de $ 29 por mes Promo para los primeros 3 meses y $ 44 a partir de entoncesFin de semana de vacaciones Especial todos los canales + DVR por 6 meses $ 24.95/month y $ 44 a partir de entonces-Oferta válida hasta el final del fin de semanaUsted puede cancelar o cambiar de plan en cualquier momento, incluyendo el plan de fin de semana de vacaciones. Los planes mensuales se renuevan automáticamente, pero usted puede cancelar en cualquier momento a fin de no facturar de nuevo cuando el actual período de 30 días ha expirado.¿QUÉ HAY DE HBO, Showtime +?Para obtener más canales, incluyendo HBO y Showtime, vea Planes de USTVNow de primera calidad con un máximo de 200 canales de alta definición y que comienzan en $ 99/mes. Estos planes utilizan un sistema diferente.NationPhone.com / USATVAbroad.htmlCOMO LLEGAR USTVNow en el televisor:Usted es capaz de ver en cualquier televisor USTVnow web habilitada para que soporte la navegación por Internet. Televisores con capacidad para conectarse a Internet se denominan televisores inteligentes. Aunque todos los televisores inteligentes conectarse a Internet, no todas las web de soporte de navegación de navegación, y por lo tanto USTVnow. Todos los televisores inteligentes, los fabricantes de como Sony o Samsung le permite conectarse a la red a través de aplicaciones, pero sólo aquellas que también le permiten navegar libremente por Internet (web habilitado) el trabajo con USTVnow. Web habilitados televisores inteligentes son generalmente de $ 300 más caros que los televisores inteligentes que no permiten la navegación libre. Web habilitados televisores inteligentes son generalmente de $ 300 más caros que los televisores inteligentes que no permiten la navegación libre. Want to watch the Olympics in Costa Rica?? It's on in English on the U.S. NBC channel. Since it does work in many other countries, what I think is PERHAPS it has something to do with Costa Rica not having any real/tight Copyright laws???? BUT - USTVNow DOES work!!! HOW DO I VIEW IT? WHO CAN JOIN?I believe it's anyone in the U.S. or outside!! IS IT RECORDED OR LIVE? It's LIVE - aired from a Pennsylvania station so on EST!!!! You can also enlarge it to your full computer screen by pressing on the little box in the bottom right corner on the bar where the volume is. For 1 month you will be able to enjoy the free service in hi resolution using your computer or our optimized interfaces for the iPad, iPhone, Android and Roku. You will be able to watch only on your computer and it will be in low resolution. If you still want to have the first month upgraded features you will have to upgrade to a paid plan, which includes not only the networks mentioned above but also the top cable TV channels. You can also upgrade sooner to a paid plan witch includes our cable channels and a DVR. No credit card info is required to sign-up for the free plan. You can cancel or switch plans at any time including the Holiday Weekend plan. Monthly plans automatically renew but you can cancel anytime in order not to be billed again when your current 30 day period has expired. For more channels including HBO and SHOWTIME, see USTVNow's Premium Plans with up to 200 channels and HD which start at $99/Month. These plans use a different system. You are able to watch USTVnow on any web enabled TV that supports Internet browsing. TVs with the capability to connect to the Internet are called smart TVs. Although all smart TVs connect to the internet not all support web browsing browsing, and hence USTVnow. All smart TVs, from manufacturers from such as Sony or Samsung allow you to connect to the web through apps but only those that also allow you to freely browse the internet (web enabled) work with USTVnow. Web enabled smart TVs are usually $300 more expensive than smart TVs that don't allow free browsing. Un taller práctico de aprovechamiento para potenciar y controlar la energía de las edificaciones con el Feng Shui de la brújula, el secreto de construcción de las dinastías imperiales. Por favor, dígales que Vicki con la vida de estar en CR blog Usted Connected! Undurraga - Undurraga.cl and Caliterra - Caliterra.com - vinyards. RSVP BY - Tuesday - July 30 - 3pm • Martes reserva 30 Julio - 3pm. PLEASE tell them that Vicki with the Living Life in CR blog Connected you!! No te lo pierdas !!! • Do not miss it! Por favor, "SHARE" este enlace con todos los que sienten que disfrutar de esto! Please, "SHARE" this link with all those who feel they enjoy it! "Atravesando la Capital: el Tranvia en San Jose" "Crossing the Capital: the Tramway in San Jose"
Hosted by Alliance Francaise in conjunction with the architect Andrés Fernández. It combines a lecture and illustrative, guided walking tour through the history and architecture of San Jose and brunch. Another of those walking tours of San José will take participants back to the days of the trolley, tranvía in Spanish, when there was not so much pollution or the crush of vehicles in the capital. Alianza Francesa is presenting the program Aug. 11, and, like similar ones in the past, there is a walking tour, a lunch and a discussion. The French cultural organization said that participants would hike part of the route and visit some of the major trolley stops. The historical excursion comes at a time when San José officials are thinking of bringing back a modern version of the trolley. San José got its first trolley in 1887 just three years after electricity was being distributed. Those who took the trolley look back on those years with nostalgia. The urban rail system was phased out 63 years later, according to the Compañía Nacional de Fuerza y Luz. Bus routes were more flexible and there was not so much concern about vehicle exhaust. The yellow trolleys ran 18 hours a day from Sabana Sur to the center of San Pedro, Barrio México and Guadalupe. One major route was along Avenida Central. Another was from Avenida Central to Plaza Víquez. The trolley system meshed with the rail service because stops were near the Estación al Atlántico. The weekday fare was 10 centavos from San Pedro to the center of San José and 10 centavos more to Sabana Sur, according to Porfirio Acosta Ramírez, a motorman and conductor whose recollections are captured on a Internet video. He said each car could carry 70 persons. The municipality has signed an agreement with a consulting firm to determine the feasibility of reinstituting a modern trolley system in the capital. A report is due at the end of the year. Not coincidentally the project is being financed by a donation by the Embassy of France. Alianza Francesa is accepting reservations for the Aug. 11 tour at its 3 locations in the Central Valley. The admission is 15,000 colons a person, about $30. SCHEDULE•DETAILS: CostaRicaCineFest.com • 2-223-0610 • 2-223-2127-xt103 • 122. Cinephiles, prepare for workshops, lectures and 80 films on the theme "Peace with Earth." Step into the home of an Iranian family. Attend the performance of a gringo mariachi. Witness the birth of psychoanalysis with Freud. And by all means, do it from a theater seat in San José, as these diverse experiences are part of the 2012 International Film Festival in Costa Rica. Made up of workshops, lectures and 80 films under the theme “Peace with the Earth,” there’s entertainment for all interests. Some of the films aim to bring understanding to different forms of violence, such as abuse of natural resources and disrespect of human life, he said. The films were selected by Nicole Guillemet, who was co-director of the Sundance Film Festival for 15 years. The festival’s guest of honor is Mexico, a trendsetter in Latin American film for more than 100 years. Accordingly, a film series entitled “What was seen in Guadalajara” will be included. The films will be judged by a jury panel, and Costa Rica’s Jaguar Prize will go to the top picture. The festival’s epicentre is La Antigua Aduana in San José’s Barrio California, where films, lectures and workshops will take place. Other locations include Magaly Theater, Plaza de Cultura, National Theater, the Children’s Museum and the Central Market, among others. The Ministerio de Cultura y Juventud and the Centro Costarricense de Produción Cinematográfica present 80 films from around the world during the 2012 international film festival beginning today. The theme “Paz con la Tierra” invites participants to view audiovisual, cinematographic and video works with story lines that encourage respect for diversity and peaceful coexistence among human beings, plants and animals. “This festival wishes to reaffirm the human dignity, promoting respect for life and contributing to the formation of a critical spirit that strengthens the collective consciousness. In that regard, the festival poses a challenge to those works of film and video that promote violence as mass entertainment in its various forms, including abuse of nature and the disrespect to all forms of life,” said organizers. The film festival had been going on for 18 years. It was usually held in November, but the ministry decided this year to change the date in the effort to bridge together the Costa Rican festival with other Latin American film festivals such as the International Film Festival in Guadalajara, México, the Icarus Film Festival in Central America, Guatemala, as well as the Festival International of the new Latin American cinema, Havana, Cuba, and the International Film Festival of Panamá. Mexico will be honored during the festival for being the starting point of Latin American movies more than 100 years ago. “Our guest of honor is Mexico, whose film has been starting point and reference for the creation and evolution of the Latin American and world cinema over more than one century. A sample of films in that country, proposed as a whole by the International Film Festival of Guadalajara, the Mexican Institute of cinematography will be scheduled as a tribute to this cinematographic heritage,” said the ministry. Costa Rica has 22 different documentaries, video clips and short fiction firms. The first will be the animation “Inalcanzable.” The United States has eight different films that include Harry Belafonte's “Sing Your Song,” “Being Elmo: A Puppeteer's Journey” and “Restrepo,” a story about men in Afghanistan. This festival runs to Aug. 4 at the refurbished old customs house, the Antigua Aduana in east San José. Other showings will be at the Magaly and Variedades movie theaters, teatros National and Melico Salazar, National Auditorium and the Mercado Central of San José. There will also be performing arts and music workshops, visual arts exhibitions, talks, forums and conferences to promote active participation and artistic and intellectual exchange, organizers said. 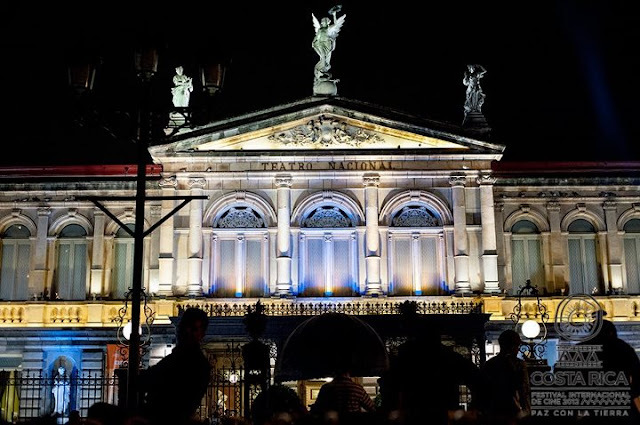 El Teatro Nacional fue el anfitrión de la inauguración del festival y abrió con una interpretación al piano del ministro de Cultura, Manuel Obregón, acompañado de una videocreación del cineasta Hernán Jiménez. Como la primera cinta internacional se presentó Chico y Rita. del prestigioso director español Fernando Trueba. “Estoy muy contento porque gracias a este festival pude venir a Costa Rica y me siento muy orgulloso de poder inaugurar este festival”, comentó el director. Durante la ceremonia, se entregaron dos reconocimientos a figuras muy importantes en el cine costarricense. Primero, se honró al fallecido miembro fundador del Centro de Cine, Víctor Vega. Su esposa e hijos recibieron el Jaguar, estatuilla del festival. También la primera directora del Centro de Cine, Kitico Moreno, recibió el premio con una ovación por parte del público. “Luego de 30 años, por fin le dan el lugar al Centro de Cine que merece y hoy brilla como una estrella en el cielo”, expresó Moreno. Invitados La presidenta de la República, Laura Chinchilla, asistió a la inauguración en compañía de su esposo, José María Rico. “Creo que el festival es una gran inspiración y traer directores de talla internacional, como es el director Trueba, es un gran incentivo para nuestros productores”, comentó Chinchilla. Por su parte, el cineasta costarricense Óscar Castillo manifestó que otras artes ya contaban con festivales internacionales y el cine merecía el suyo. “Cada vez que algo crece es beneficio so para el país”, agregó. WHERE: La Guácima - West of the airport, near the Butterfly Farm. PRICE: Please bring food or drinks to share. RESERVATIONS: Directions given upon RSVP - CR.DemocratsAbroad@yahoo.com or call Nelleke at 2-279-3553. They will provide van or bus transportation for 5,000 colones - round trip/per person. 10:30am - Teatro Nacional (South/Avenida 2nd/Segundo side). Please arrive at the bus stop before the scheduled time. Please "SHARE" these links with EVERYONE you could think of that would enjoy his music. Vivir la vida en Costa Rica blog en el que se refiere. en Vivir la vida en Costa Rica blog en el que se refiere. Little Theatre Group - "My Life as a Crazy Quilt"
"LOS OJOS DE LA HISTORIA SOBRE EL EYE ON HISTORY"